3:30 – 5:30pm Celebration of Light with Tea Meditation and Spiral Walk: In a cozy meditation hall tucked in the forest we will gather to share tea, cookies, singing and stories from all traditions (you are welcome to bring a story, song or poem!) culminating with a winter spiral walk. 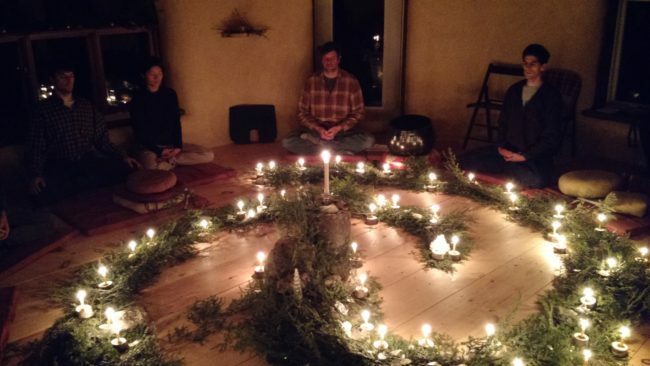 With quiet song and reverence, the room moves from complete darkness to radiant light as, one by one, each of us (adults and children) adds our candle to the evergreen spiral in the center of the room, placing a prayer of virtue and peace.